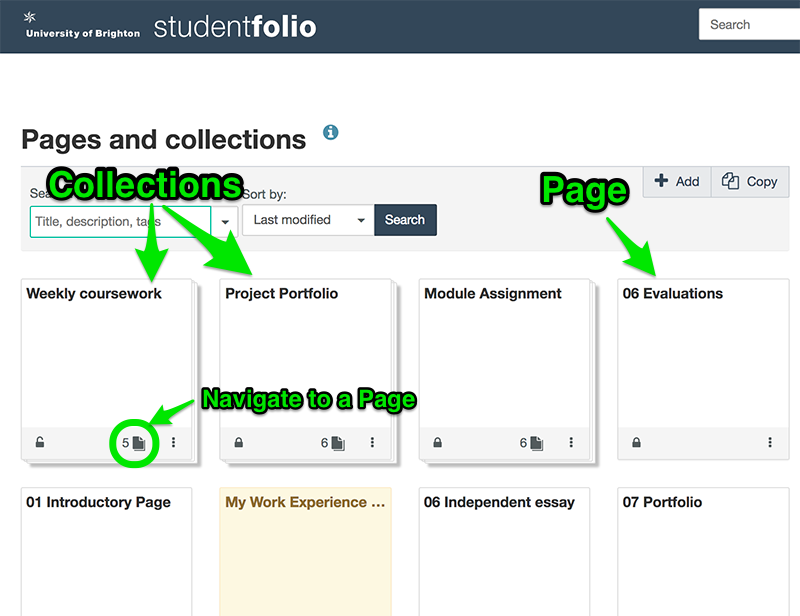 The main change you will notice after logging into studentfolio after 15th August is the replacement of the tabbed navigation at the top of the screen with a more app-like one that will already be familiar to users who have accessed studentfolio on mobile devices. This is how you access all your content, including portfolio Pages and Collections. The User menu navigation with access to the profile page, Settings, Inbox and Logout. Pages and Collections are now displayed together on a single screen as portfolios – there is no more switching between the ‘Pages’ screen and the ‘Collections’ screen to find out which Pages exist and which ones are in a Collection. Collections are displayed as a stack, indicating how many Pages make up the Collection. You can navigate directly to an individual Page in the Collection by clicking on this displayed number. You can now view the date and time a Page was created and last modified from this screen. A Page/Collection which has been submitted for marking is still highlighted as yellow. The new ‘print’ option allows you to print a portfolio page without showing the URLs. In addition, retracted blocks and collapsed artefact information is automatically expanded for easy viewing. You can also use this option to ‘Print as PDF’ if you need to submit a copy of your page/s to studentcentral for marking and originality checking. You can now delete a Page directly in the edit view, so you no longer need to go back to the Pages and Collections overview page. This helps to avoid accidentally deleting the wrong Page. 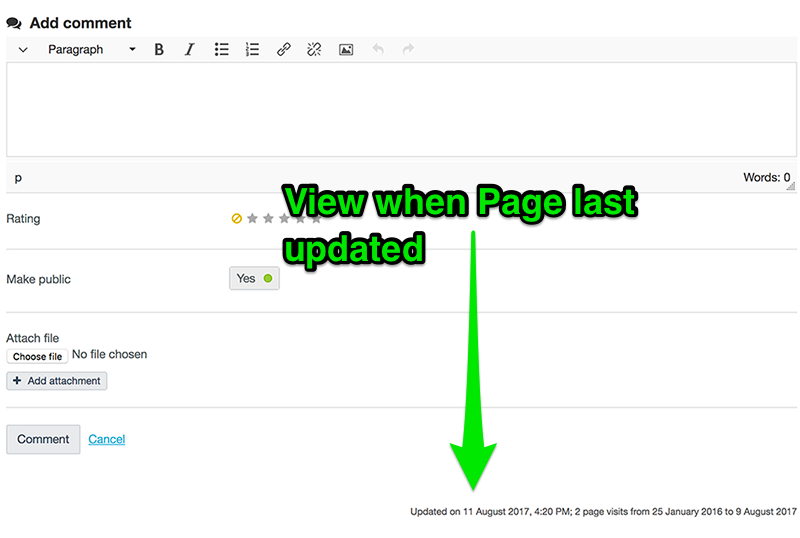 Anyone with access to a Page can now see when it was last updated. This snippet of text is visible at the bottom of the Page, below the comments section. It’s great to see the updates.